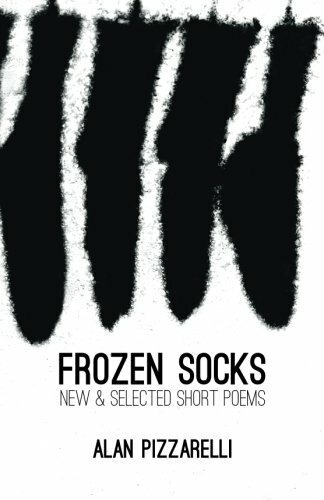 Frozen Socks, by American poet, Alan Pizzarelli, is the most comprehensive collection of his work to date. The book contains selected short poems from 1969 to 2015, many of which have been widely anthologized around the world and have become modern classics of original English-language haiku and its related forms. “Pizzarelli has filled the American haiku and senryu world with imperishable and wonder-filled images that have immeasurably enriched our literature. ...This latest collection of his holds an amazing variety and range of accomplished and exceptionally outstanding work. From his early poems about amusement parks and carnival acts to his more recent excursions into the worlds of baseball and cowboys, urban landscapes and back-alley glitter, Pizzarelli has managed to open up haiku and senryu to the whole panoply of modern American life. This book gathers it all together in one volume..."
Highly recommended! -- Al is the "trickster.